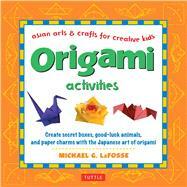 Fold classic origami projects and learn about Asian culture with this easy origami book. Origami, the Japanese art of folding paper, is not just a great crafts activity—it's an exciting way to expand the imagination. Children will have hours of fun with this beginner origami paper craft book. Renowned origami artist and author Michael LaFosse designed Origami Actives to introduce them to the exciting world of paper folding. What makes this origami book original is that each paper project explores a distinct aspect of East Asian culture and includes an explanation of the cultural context for each project. The designs are very simple and are great for beginning origami folders. They can be considered origami-for-kids projects and are a great way to learn origami. Once you've folded your own origami, you can use them to create one-of-a-kind origami scenes. Michael G. LaFosse has been an origami artist for over 40 years and is considered a leading authority and master of the art. An avid teacher, LaFosse co-founded the Origamido Studio, a learning center and design studio dedicated to the art of origami and the only place in the world specializing in hand papermaking for the origami artist. Author of many books and videotapes relating to paperfolding and hand papermaking, LaFosse produces fine paper art and commercial designs for a variety of international clients.